Win a FREE Birthday Cake: We give 5 away each week – just listen to WRJW and call in your name and your birth date – good luck – you may win a Birthday Cake! We’ve given away 1,000’s of birthday cakes away over the last 35 years!! Win a FREE King Cake: We give 5 away each week – just listen to Kicker 108, call in your name and your birth date – good luck – you may win a King Cake! We’ve shared 1,000’s of King Cakes in South Mississippi over the last 15 years. Every Tuesday – Senior Citizen 15% discount. We have lots of Sr. Citizens in Pearl River County – take advantage of us!! Paul’s Pastry offers an all-day, everyday 10% discount (Up to a $200.00 maximum) to our active, reserve or retired Military Personnel and their Spouses with a valid military ID card. This also includes Uniformed Officers (Police Officers, Firefighters and ENT’s). Get your copy of Picayune Item’s Picayune Living Magazine and take advantage of our coupons: “Buy 1 dozen Butter Crunch cookies & get a Dozen FREE” and “$2.00 OFF any Lunch Special.” Our Café is open from 11am-2pm Monday – Saturday. (1 per person per visit & coupons cannot be combined). Get your copy of WRJW’s Sr. Magazine and take advantage of our coupons: $5.00 off any $30.00 purchase; Buy 1 dozen Butter Crunch cookies and get a Dozen FREE. (1 per person per visit & coupons cannot be combined). 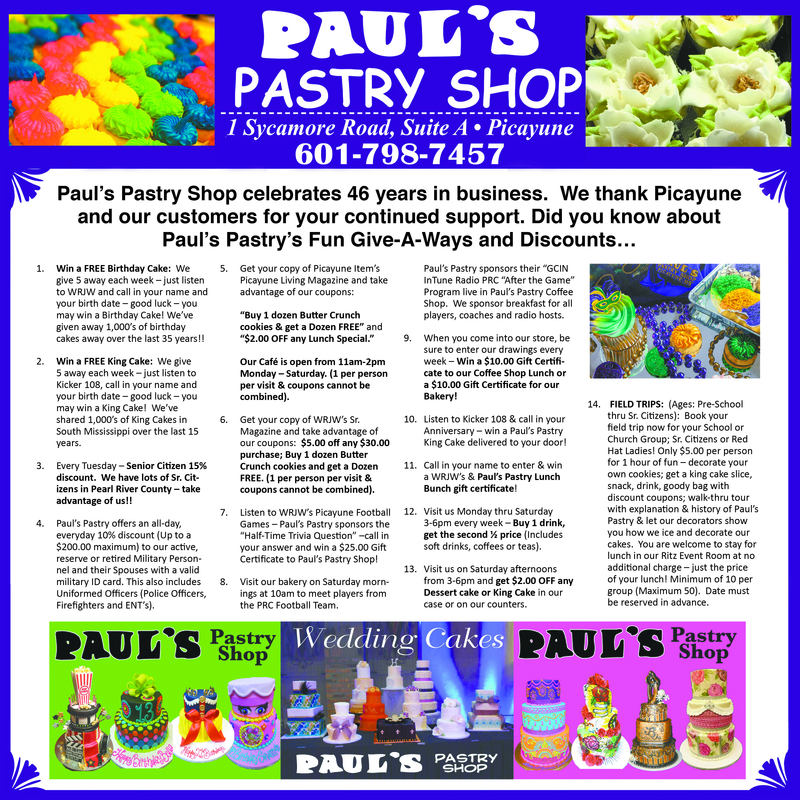 Listen to WRJW’s Picayune Football Games – Paul’s Pastry sponsors the “Half-Time Trivia Question” –call in your answer and win a $25.00 Gift Certificate to Paul’s Pastry Shop! Visit our bakery on Saturday mornings at 10am to meet players from the PRC Football Team. Paul’s Pastry sponsors their “GCIN InTune Radio PRC “After the Game” Program live in Paul’s Pastry Coffee Shop. We sponsor breakfast for all players, coaches and radio hosts. When you come into our store, be sure to enter our drawings every week – Win a $10.00 Gift Certificate to our Coffee Shop Lunch or a $10.00 Gift Certificate for our Bakery! Listen to Kicker 108 & call in your Anniversary – win a Paul’s Pastry King Cake delivered to your door! Call in your name to enter & win a WRJW’s & Paul’s Pastry Lunch Bunch gift certificate! Visit us Monday thru Saturday 3-6pm every week – Buy 1 drink, get the second ½ price (Includes soft drinks, coffees or teas). Visit us on Saturday afternoons from 3-6pm and get $2.00 OFF any Dessert cake or King Cake in our case or on our counters. FIELD TRIPS: (Ages: Pre-School thru Sr. Citizens): Book your field trip now for your School or Church Group; Sr. Citizens or Red Hat Ladies! Only $5.00 per person for 1 hour of fun – decorate your own cookies; get a king cake slice, snack, drink, goody bag with discount coupons; walk-thru tour with explanation & history of Paul’s Pastry & let our decorators show you how we ice and decorate our cakes. You are welcome to stay for lunch in our Ritz Event Room at no additional charge – just the price of your lunch! Minimum of 10 per group (Maximum 50). Date must be reserved in advance. This entry was posted on Friday, September 30th, 2016 at 5:41 pm and is filed under Specials. MY HUSBAND & I CAME ON A FIELD TRIP WITH MY GRANDDAUGHTER FROM FIFTH WARD JUNIOR HIGH. WE NEVER HAVE BEEN TO YOUR PASTRY SHOP. IT WAS QUITE AN EXPERIENCE. THE STAFF WAS SO POLITE AND WELL INFORMED OF HOW YOUR SHOP IS HANDLED. WE LOVED THE SHOWING OF HOW THE CAKES ARE MADE. WE HAD LUNCH AND IT WAS VERY DELIGHTFUL. WE WERE IN “AUH” OF ALL THE CAKE DECORATIONS AND ALL THE PASTRY THAT YOU HAVE AVAILABLE. THANKS FOR THE GREAT MEMORY! WE’LL BE BACK!! !